The first thing which comes to your mind is Fluttering prayer flags, barren yellow golden landscape, and huge blue lakes.This region is referred as the land of high mountain passes. There is an old saying in Ladakhi “who comes to Ladakh is either the best of friends or the worst of enemies”. 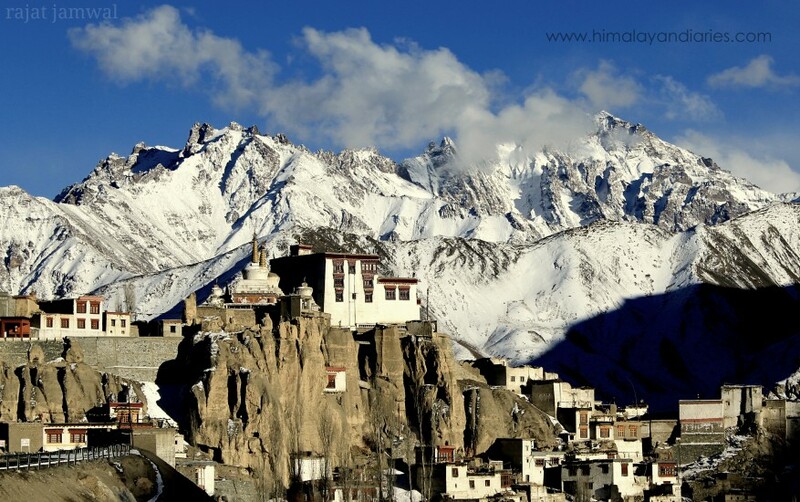 Ladakh is located in the eastern part of the state of Jammu and Kashmir. It is mostly barren, because it falls in the rain shadow area. This makes it a popular travel destination, because you have longer climbing and trekking seasons. The barren mountains have different colours varying from tingy purple to golden yellow. The well maintained roads across high passes and though broad valleys makes it a ideal destination for leisure road journies as well. The vibes and the exorbitant charm this place has cannot be explained in words, you simply have to be there to feel it. The elevation of the region varies from 2760 metres in Kargil to 7672 metres on the summit of Saser Kangri. The average elevation of most destinations on the road is 3500 to 4500 metres. The passes are much higher with the highest being at Khardungla at 5359 metres being the highest. It’s huge blue water lakes, enchanting landscapes, long tranquil treks, and high challenging mountain summits makes Ladakh a great paradise for travellers around the world. 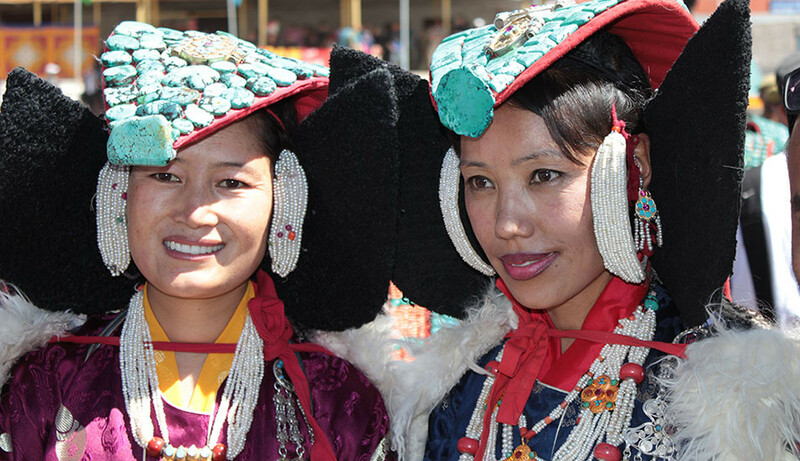 The clean dry air, magnificent scenery and the warm hospitality of the people makes Ladakh a truly special place. 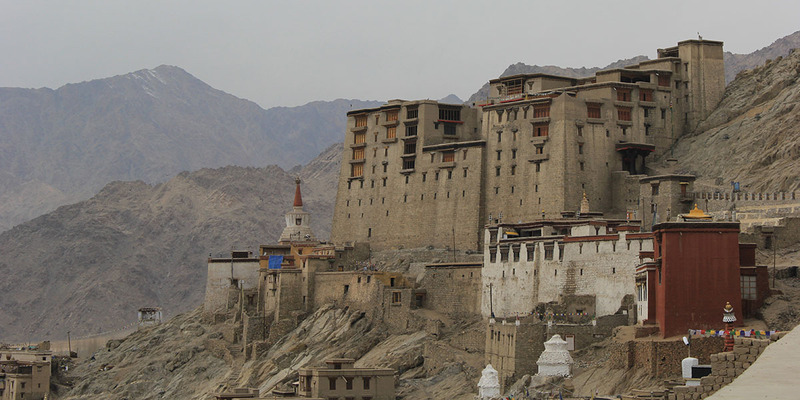 Ladakh is assessable by air route from Delhi only. There are daily 3 flights of Go, Jet and Air India. There are two routes by road to reach Ladakh.
. Manali to Leh via keylong and Sarchu, which is 475 kms. .Srinagar to Leh via Drass and Kargil, which is 434 kms. Status of the roads as on for now, May 4th 2017, Srinagar Leh is closed via Jozilla pass, and Rohtang pass is also closed if you want to take the Manali- leh highway. All flights to Leh are operating. On the Manali Leh highway 15 kilometres from Leh is the Shey Palace and Monastery. The Palace is in ruins now, but the archaeological survey of India has started preserving this site. The palace has many large room, the windows of which offer excellent views of the Ladakh landscape. The protruding balconies and windows are excellent for taking photographs, as you can see the entire valley upto the Stok mountains. There is also a small hillock which is joined to the palace. Climbing up this hillock can be a lot of fun. 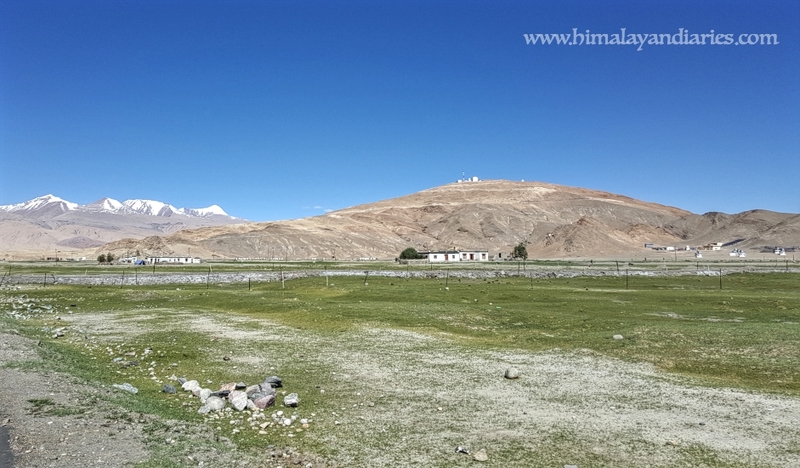 The area near Shey is full of many small and big Chortens, making it Ladakhs biggest Chortens field. Leh is 475 kms from Manali, and 434 kms from Srinagar. This is a base for mostly all journeys, treks, and expeditions across Ladakh. it is the biggest market centre in all ladakh. There are shops catering to all things a traveller requires. There are numerous hotels, guest houses and restaurants here. This is a travellers paradise. 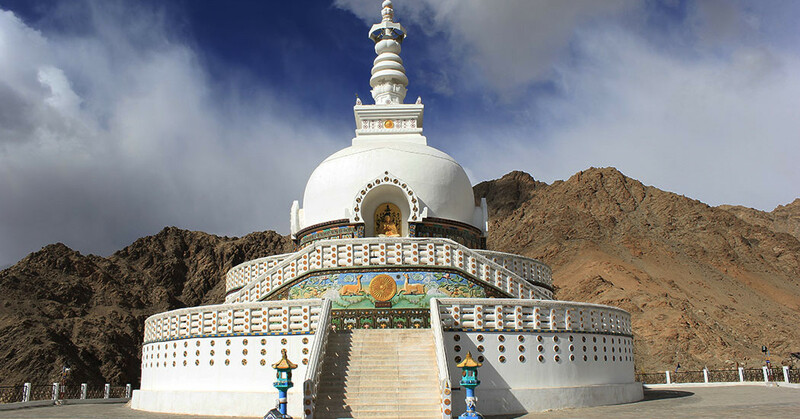 The main places to visit once in Leh are. It’s a 15 minute climb from Changspa to the top of a high rocky ridge. 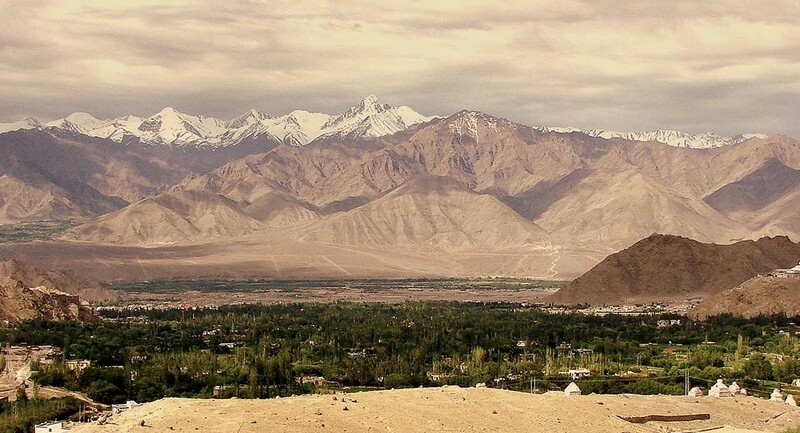 There is a stunningly beautiful view of Leh town and the Stok mountains from here. This has become the primary reason for Shanti stupa to become a popular travellers destination, apart from it’s religious significance. There is also a drivable road to the stupa. it was built in 1991 by a Japanese monk to promote world peace. This place has an exuberant charm. This place has that traveller vibes which gives a feeling of youth and freshness, that makes it a complete travellers corner in Leh. It has lots of travel offices,Internet cafes, Garden cafes, travel cafes catering to menus for people from all over the world. You will find lots of budget hotels offering clean accommodation here. During summers months this place is flooded with travellers from various countries. During these months a lots of meditation and yoga camps and classes keep happening here. It is in these cafes that plans for expeditions or for a trek across the Markha valley is made. It’s a world of it’s own. It is exotic to the locals and foreigners alike. There is something here for Indians and foreigners both. You have cafes which cater to foreign menus, and there are shops which have Indian things ,so there is a nice blend of cultures. Behind Chanspa you can go for short walks as there is less of traffic. There is an Ice skating ring here, which is bustling with activity once the ice forms during winter months. There is an Ice hockey tournament held here annually. A short drive away from the Leh bazar, or you can even walk this short distance. Unlike many forts which were constructed on steep hillocks, Zorawar fort is located on flat land. This fort was constructed by the famous High altitude warrior Gen. Zorawar singh in 1936. It was built for his brave Dogra soldiers who stood by him during his conquest. The fort is made up of local material like dried mud and wood. It has a area of about 27 acre. Each corners of he fort have towers which were used for observation. There is a mosque, and a temple inside the fort. 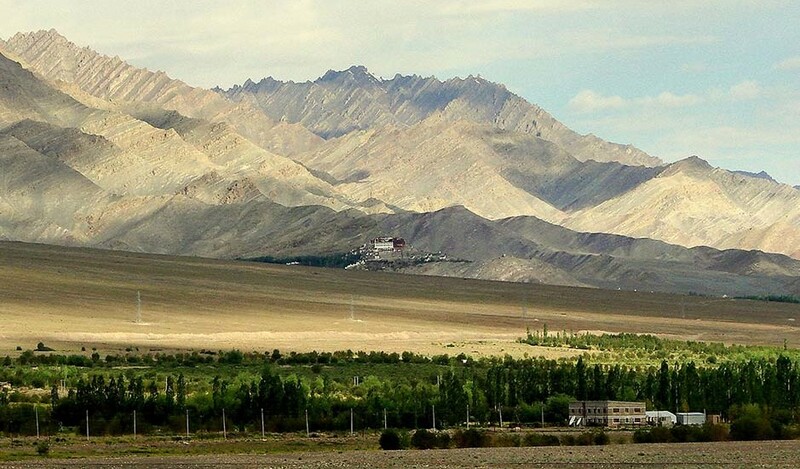 Stok was also the erstwhile seat of the Ladakhi royal family. Descendants of the royal family still reside in this palace. The palace was built in the year 1825 by the king Tsespal Tondup Namgyal, who was the most recent ruler of Ladakh. The view from the palace is fabulous, as you can see the surrounding barley fields and white washed farm houses.There is also a Museum here. The museum has artefacts from the royal households, and ancient copper currency. 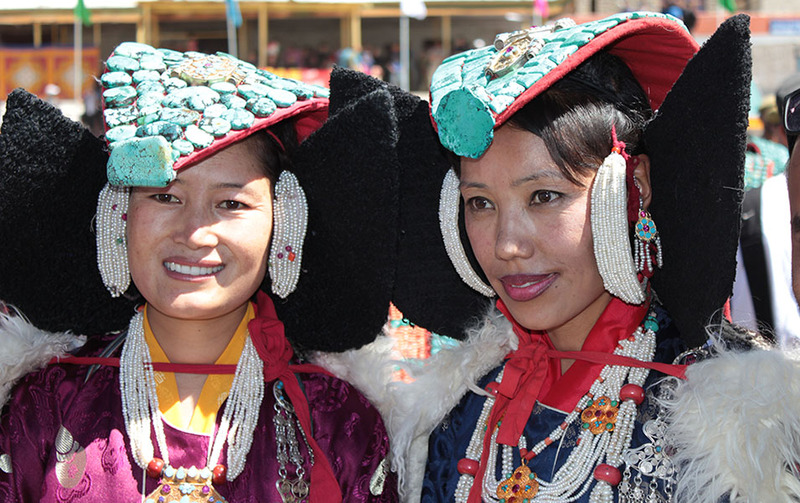 There are also costumes, seals, prayer material, turquoise, old jewellery and traditional attires of the Royal family. There are also thankhas that portray the life story and teachings of lord Buddha. 2.00 P.M to 6.00 P.M. Rooms are also available in the palace for guests. This place is famous for it’s monastery. It is situated 18 kilometres from Leh on the Srinagar highway. The spituk gompa was founded in the 11th century by a monk Od-De. The gompa was named Spituk which means exemplary. The monastery is known for it’s 21 exquisite statues of Tara, the consort of Avlokitesvara all representing her different manifestations. There is a Mahakaal temple on the hill top containing the shrine of Vajrabhairava. It is only in January, that the face of Vajrabhairava is unveiled during the annual festival. The famous Spituk festival called Gustor is held every year on the 17th and 19th day of the 11th month of the Bodhi calendar. This region falls in the rain shadow region of the Himalayas, so it has very less precipitation. It can get very cold in winters and the temperatures can go as low as -25. In the months of October and March snow leopard treks are organised so that people can get a chance to spot this magnificent creature in it’s natural habitat. In the National park no hotels are available. There are 6 villages which come under the National Park. The permit is available at the office of the Wildlife warden or the D.C Office at Leh. The fee is Rs. 20 for domestic and Rs 100 for Foreign nationals. While driving towards Leh on the NH 1 highway, 107 kilometres from Kargil and 127 kms short of Leh is a picturesque village of Lamaruyu. The very first sight of a monastery perched on top of a golden yellow hillock, with the snow clad mountain backdrop is breathtaking. It is one of the most ancient monastery of Ladakh. it is said to have been built in the 10th century. The monastery has Dukhang, a big assembly hall, Gonkhang, the temple and a residential area for monks. Walls of the monastery are painted with colourful images of buddhist deities. There is an annual festival by the name of Yuru Kabgyat is a major attraction for travellers. The major highlight of the festival is the mask dance by the monks. There is also a ritual in which effigies are burnt, which symbolises the destruction of ego in every individual. Lamayuru is also called “Tharpa Ling” which means the “Place of freedom. Lamayuru is also famous for its moon like landscape. The best view is from the window of the monastery towards the East, and from the road 1/2 kilometres towards Kargil. Lamayuru has a few budget type hotels, and a few home stays inside the village. The accommodation is humble, and you have the meals with the family in the dining area. There are a few small eating house which offer simple Indian meals and tibetan food. The land which is known for it’s white sand dunes, flowers, orchards, and double humped Bactrian camel. It was originally called Ldumra which means valley of flowers. 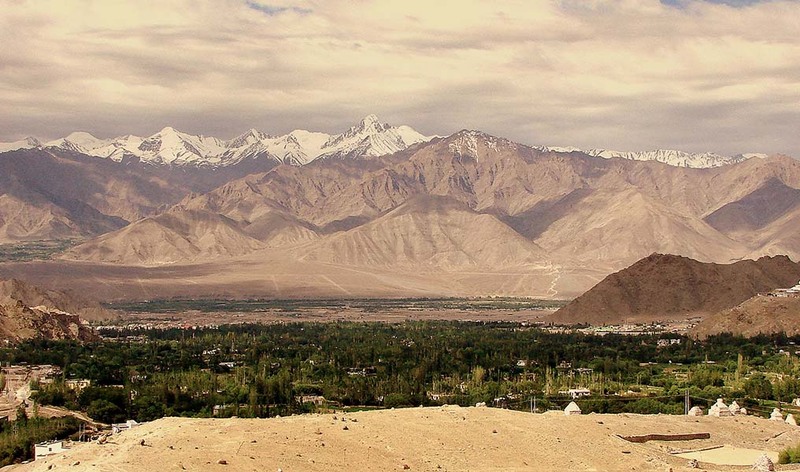 Nubra lies North east across the Khardungla pass from the town of Leh. The road is open through out the year. There is also another route over the Wari La from Sakti connecting the road to Nubra via Agham. 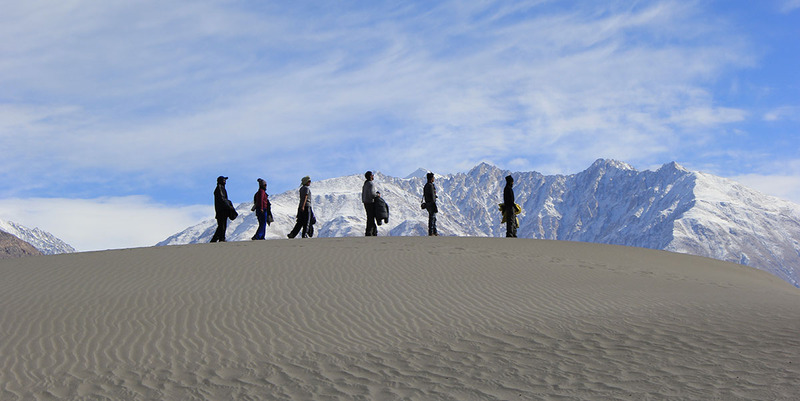 The main town of Nubra valley named Diskit is 150 kilometres from Leh. Sumur is a quite and peaceful village in the Nubra valley. It has wonderful green and yellow mustard fields. It has the famous Samstemling Gompa, which was founded by Lama Tsultrin Nima about 150 years ago. Sumar also has it’s own sand dunes and camel rides. The road to Sumur bifurcates just before Diskit. It is 23 kilometres off the main road. There is also the village of Tegar near Sumur. If you continue on the road ahead you will reach Panamik, which is surrounded by snow capped mountains. The scenic beauty and it’s hot sulphur springs attracts lots of visitors every year. Panamik is 22 kilometres from Sumur. Turtuk is a tiny hamlet at the end of the road before the Line of control. It is the extreme corner of the Indian border, so it is a challenge reaching here. The road is treacherous at places after Hunder , and there are a lot of landslide areas. There are a lot of sensitive army bases here so permits were not issued before 2010. Now you get permits from the D.C. office in Leh to go there. 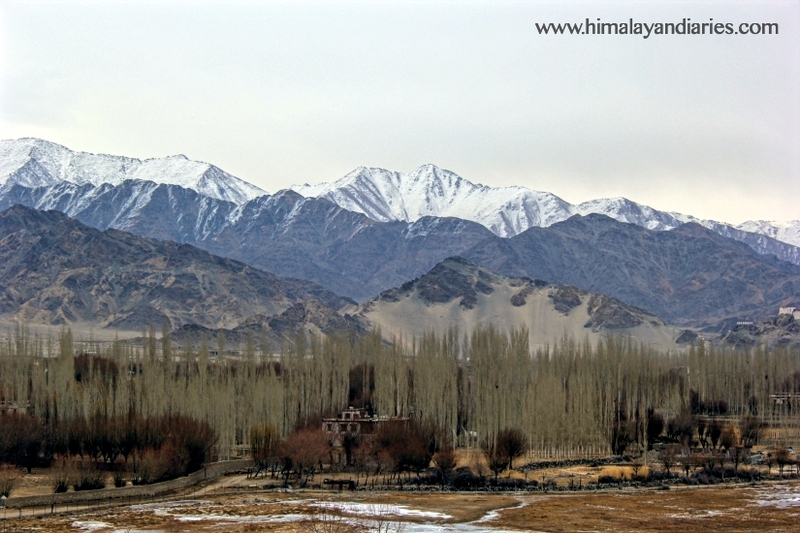 The drive is along the River Shyok, and there are views of snow capped mountains all along the way. But once you reach Turtuk, you will forget the fatigue and you will know why this place is termed as heaven on earth. Turtuk is basically a muslim dominated village unlike buddhist dominated Ladakh. This village is also known for its wonderful, and welcoming people. It is also at a lower elevation than most habited Nubra. 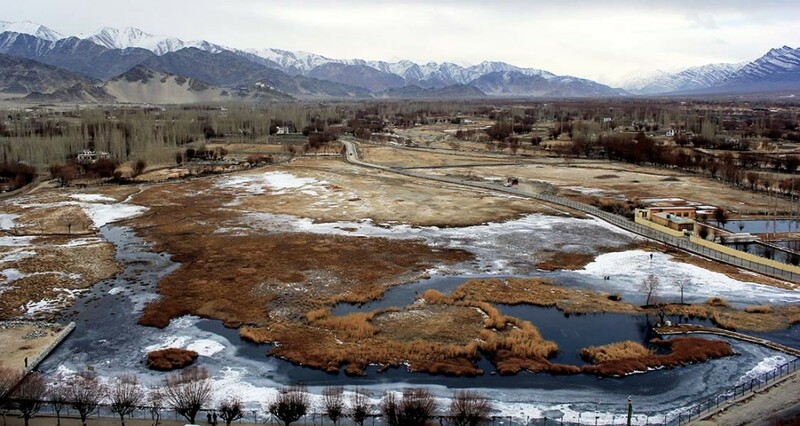 Unlike the barren landscape of Ladakh, Turtuk is full of green pastures. Apples, Apricots, Tomatoes, Cauliflowers and cabbages are grown in plenty. This place has a few humble home stays. Turtuk is still culturally intact and there are still very few visitors. In all Turtuk is a travellers paradise, here the smiles of the people are more sweeter than the apricots. A view of Changla top with the Chang La baba temple. 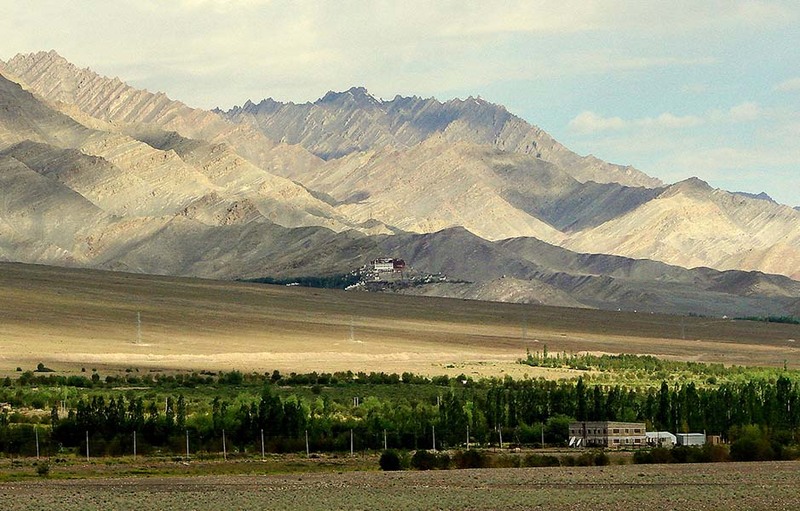 Changla is 75 kilometres from Leh. At an elevation of 5360 metres ,it is the third highest motor able road assessable to ordinary civilians. 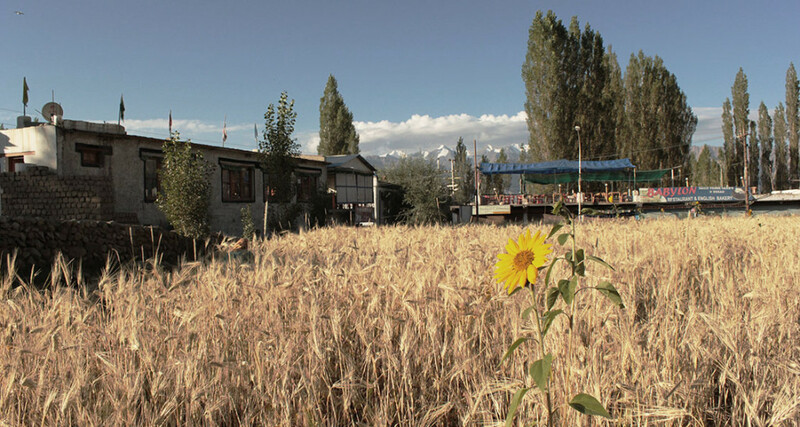 The Changla is the gateway to the Changthang Eco zone, which is home to variety of flora and fauna. The road to Changla cuts from Karu. 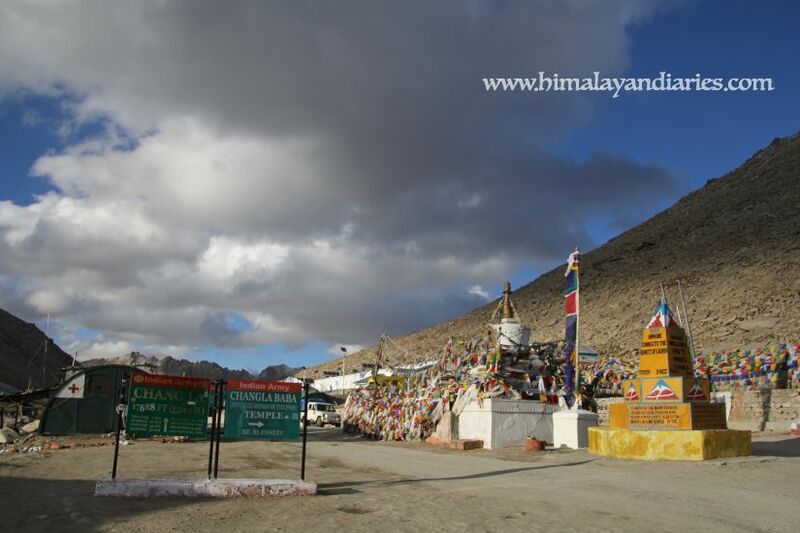 The road is of special significance to travellers because it comes enroute Pang gong tso. As you get on to of the pass you can hear the prayer flags fluttering in the cold air. There is a temple dedicated to Changla baba here. There is a cafeteria, which is run by the indian army, which offer a wonderful cup of free black tea. You can get a plate of hot steaming momos for a decent sum. There is also a souvenir shop here which sells mementos like T shirts, coffee cups, key chains etc. There is also a Medical centre which offers first aid and has supplementary oxygen. Chang La has a good amount of snow in winters, but the road remains clear although the year. 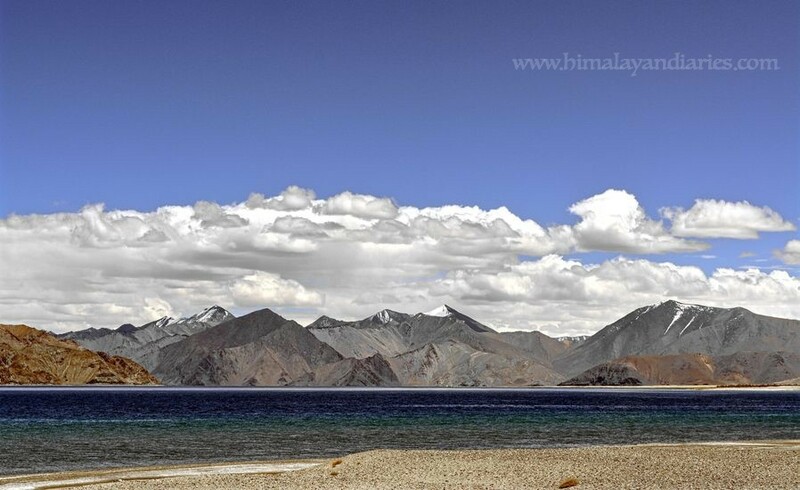 Pang gong is a beautiful lake located 150 kilometres from Leh across the Chang La. It is one of the most beautiful of places in the Himalayas, that will give you a experience of a life time. It is indeed bliss to be here. At an elevation of 4350 metres above sea level it is one of the largest high altitude lakes in the world. Spangmik has more staying options than Lukang. There are quite a few home stay options, and a few luxury lodges. There are ample tented camps resorts. Maan has a luxury camping site along with a few budget camping sites. Maan is 9 kilometres from Spangmik. Merek has a few homestay comparatively. There are many camping and tented accommodation available at Pang gong lake from Lukung village (first settlement at the lake) till Spangmik ranging from Rs 500 to Rs. 3500 depending upon services like attached toilets, hot water, meals, and luxury inside the camp or tent. Man and Merek have limited accommodation. Merek has a green grassy belt next to the lake and is sparsely habited making it a popular destination for traveller who want to spend some time by themselves. The sunset at the lake is more beautiful than the sunrise, but that does not stop you from having a morning walk along the lake. The Lake acts as a breeding ground for a variety of birds including a number of migratory birds. During summers the Bar headed goose and ducks are commonly seen here. The region around the lake supports a number of wild life species mainly the Kiang and Marmot. There are a lot of spots where you can sit and relax near the lake. The ones till spangmik draw lots of visitors during summers, but as you go towards Merek, you get more solitary places. There is also a place where waves are formed like in the sea which is near Merek. 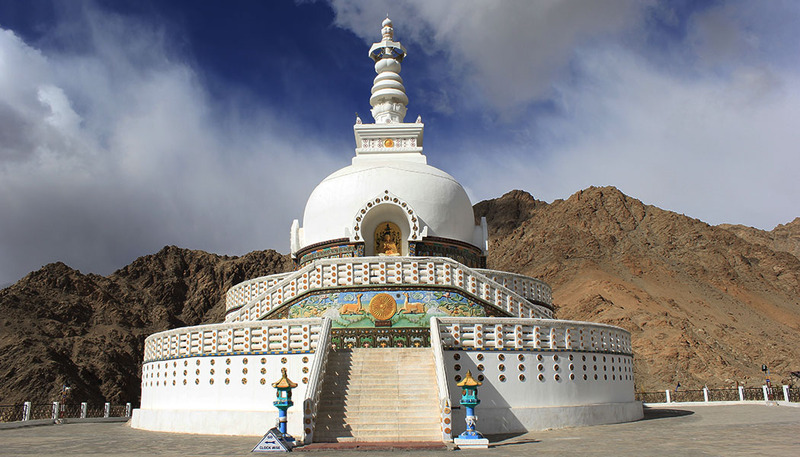 Chushul is a viilage located between Nyoma and Pangong Tso at an elevation of 4360 metres in the Changthang province. This area is relatively less travelled. There is a vast stretch of dry barren valley before one reaches Chushul. One comes across this village, while taking the road journey from Tso Moriri towards Panggong Tso. You need a special permit to take this route and you can by stopped anytime by the Indian Army. This is because Chushul is one of the 4 official BPM (Border Personnel Meeting ) points between the Indian and the chinese army, when ever tension arises on the border. Regular interactions take place here to defuse face off situations. Chushul has a Govt rest house. Hanle also as an Astronomical Observatory, which at an elevation of 4500 metres is one of the highest in the world. The valley is ideally suited for astronomy. The Valley is wide and there is very less precipitation. The diameter of the telescope is about 2 metres. The observatory is operated from Bengaluru by the Indian institute of Astrophysics. Hanle has a monastery which has it’s own unique charm. The monastery dates back to the 16th century. It belongs to the “Red Hat” Tibetan Drukpa Kagyu branch of Tibetan Buddhism. The small hamlets of Khuldo and Punguk are located near Hanle. Due to it’s proximity to the sensitive border with China, You have to take special Inner line permits for visiting this place. The permits are available at D.C office, Leh. This is nature’s one of the most exquisite creation in the western Himalayas. . Tso moriri is a beautiful high altitude lake in the changtang area of eastern Ladakh. It is secluded in the Rushpu valley about 245 kilometres from Leh. At an altitude of 4522 mtrs above sea level , it is approx. 23 kilometres long and 4 to 7.5 Kilometres wide. The heritage village of Korzok overlooks the lake. The thing that makes this lake special, is that this lake is a High altitude wetland conservation site, which is governed by the Ramsay convention held in Iran. This means that this is a protected site e.i. you cannot camp and pitch your tents near the lake. This has helped in maintaining the 🙂 natural beauty around this picturesque lake . Infact before Korzok the area near to the lake is fenced ,because there are many migratory bird here. Once you cross Korzok you can go anywhere near the lake. The Suru valley is the gateway to Zanskar from Kargil Side. The road which goes through the Suru valley, continues into the Zanskar region across the Penzi La(14000 feet) pass till Padum. The area is is habited by the Tibetian Dard community, who are Muslims. They converted into Islam during the 15th century. The people are extremely hard working and agriculture is the primary occupation of the people. Rangdum is located at an elevation of 3657 metres, 120 kilometres from kargil in the Suru valley. It is surrounded by snow capped mountains on one side, and rocky cliffs on the other side. It is a small Hamlet with barely a dozen houses. There are a few home stays and guest houses here. There is also a J.K Tourism Bungalow and a P.W.D rest house here. If you want to visit Padam across the Penzi La, this is the perfect place for a night halt. Rangdum is also famous for it’s 18th century Random Monastery. Penzi La is the 14000 feet high mountain pass, which connects the Suru valley with the Zanskar Valley. There is a dirt and rock filled road up to the pass. The ascend is moderate. Two small lakes called Statso-lang and tso Kartse Khar is just before Penzi La. Penzi La is open from June to October. Padam lies 00 kilometres from here. Padam is the main town of Zanskar region. Padam is more famous for being the last destination of the world famous Chadar trek.